At Surfersskin, we know surfing. We know that satisfaction of catching the perfect wave; feeling free and alive as the sun beats down on your face. The truth is though, wetsuits can only protect so much of you. That’s why we created Surfersskin, an Ultra Performance SPF 30+ sunscreen that can handle extreme conditions as well as you can. Surfersskin is water and sweat resistant, and formulated to meet the highest sun care standards in the world. Designed to give protection in the water for up to 2 hours, its non greasy formula won’t run into your eyes, leaving you free to focus on the thing you really care about – spotting those waves. 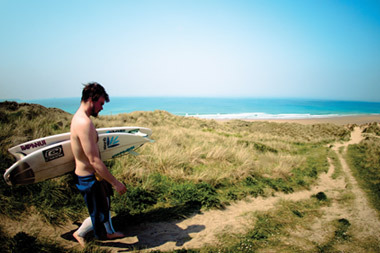 We also know that you wouldn’t surf in a sea full of chemicals, so whilst Surfersskin has a high UVA, UVB and Broad Spectrum protection, it’s also made using a PABA-free formula. 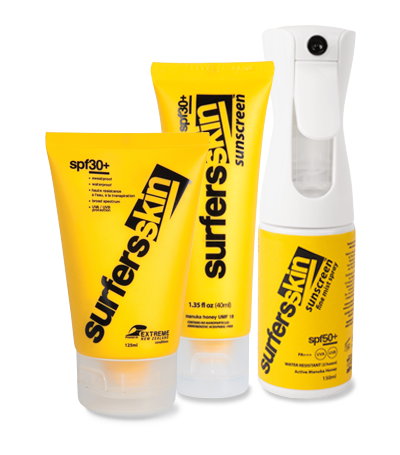 Surfersskin: Helps keep your skin as alive as you feel.